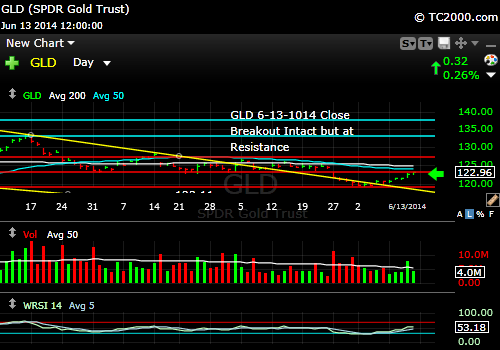 ← Market Timing Brief for the SP500 Index, Gold and Treasury Yield Closes on 6-06-2014: Stock Market Breakout. Gold’s Early Tentative Rally. Rates Rising Again. 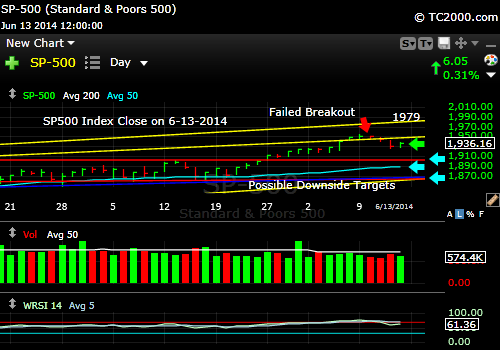 Market Timing Brief for the SP500 Index, Gold and Treasury Yield Closes on 6-13-2014: Stocks Fail a Breakout. Gold Rallies. Treasuries at a Pivot Point. The SP500 Index has finally failed to hold an important breakout above an upper channel line indicated by the second yellow line from the top on the chart below. Until the Bulls reclaim the yellow line we are just below now in the chart, the Bears have the ball and we could fall to any one of the targets marked by the aqua arrows in the chart. The 50 day moving average is at the middle aqua arrow shown. To find out about all of my market allocations at the moment, please subscribe here: Free Subscription to My Newsletter and access to My Latest Comments/Strategy There is one market in particular that you don’t want to be a part of for the time being and the allocation list makes that clear! If the Bulls do regain the last breakout, 1979 would be the next SP500 Index upside target. It will be interesting to see if the Fed changes its policy direction or if it continues on its stated path of lowering QE and ignores the recent soft GDP and housing numbers. Gold still in rally mode. Rates look like they have entered a pattern very similar to that appearing at the end of April. 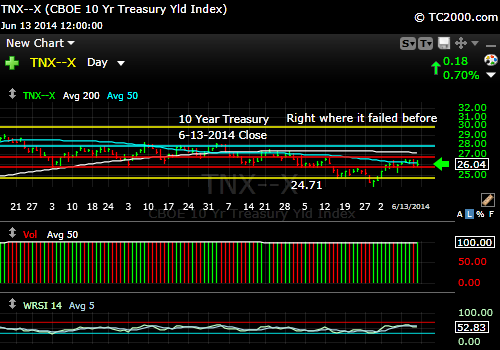 The yield has stalled around the 50 day moving average. The Fed could throw a big monetary monkey wrench into things this Wednesday with their meeting announcement on FOMC policy and also at the dog and pony show at 2:30 pm ET by Chair Janet Yellen. The market will respond to anything substantive done by the Fed this Wednesday. The ECB came up short recently with their policy announcements and disappointed the market. Things are probably not dire enough for a big dovish shift in policy, but there are those betting on it with real money. The Fed has been lowering QE and rates have FALLEN, not risen, because the Fed has continued to buy up even more of the debt that the Treasury has been issuing as explained last week, but the QE equilibrium could shift to a net tightening as the program is reduced even further. If the Fed continues QE without hesitation this Weds. the market may start to sell off some bonds and drive rates up. We may see the 10 Year rate go sideways until Wednesday as it waits for the Fed statement. I don’t know about you, but I’m tired of having our government front the easy money for the rest of the world. Are we going to allow the ECB sit back while we further destroy our currency? This entry was posted in Bonds, gold, investment, large cap stocks, S&P 500 Index, Treasuries and tagged 10 year treasury, federal reserve meeting, gld, gold etf, market timing, sp500 index, spx, spy, tbt, tlt, tnx. Bookmark the permalink.